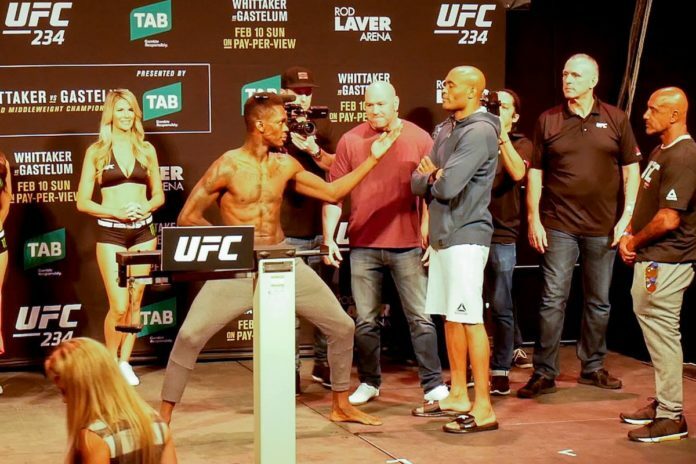 UFC 234 was held today (Feb. 10) at Rod Laver Arena in Melbourne, Australia. The scheduled for three rounds middleweight battle between Anderson Silva and Israel Adesanya headlined the event. The middleweight championship bout between the current titleholder Robert Whittaker and the challenger Kelvin Gastelum fell off when the champion was forced to withdraw “due to a severe abdominal injury requiring emergency surgery”. The Anderson Silva vs. Israel Adesanya fight went the distance. After three rounds of spectacular MMA action a unanimous decision was pronounced in favor of Adesanya. The co-main event featured the lightweight matchup between Lando Vannata and Marcos Mariano. The bout ended in the first round with Vannata earning the win by submission. Also on the main card Rany Yahya squared off against Ricky Simon at bantamweight. The three round bout went the distance ending in favor of Simon who earned a unanimous decision. As well, Montana De La Rosa and Nadia Kassem battled it out at women’s flyweight. The bout ended prior the final horn. De La Rosa took the win by submission in the second round. In addition, local light heavyweight Jimmy Crute stopped Sam Alvey in the first round with punches. The Australian fighter dropped his American opponent to the canvas with right cross. Crute believed it was all over and started walking off, yet the latter got up. Crute resumed fight action and claimed the win with punches which followed right kick to the head. Live results and updates can be found below. Lilian Dikmans of FIGHTMAG reported from Rod Laver Arena. The five-fight PPV card followed the preliminary card comprising four matchups on ESPN. MMA actions kicked off with the two-fight early preliminary card on UFC Fight Pass.